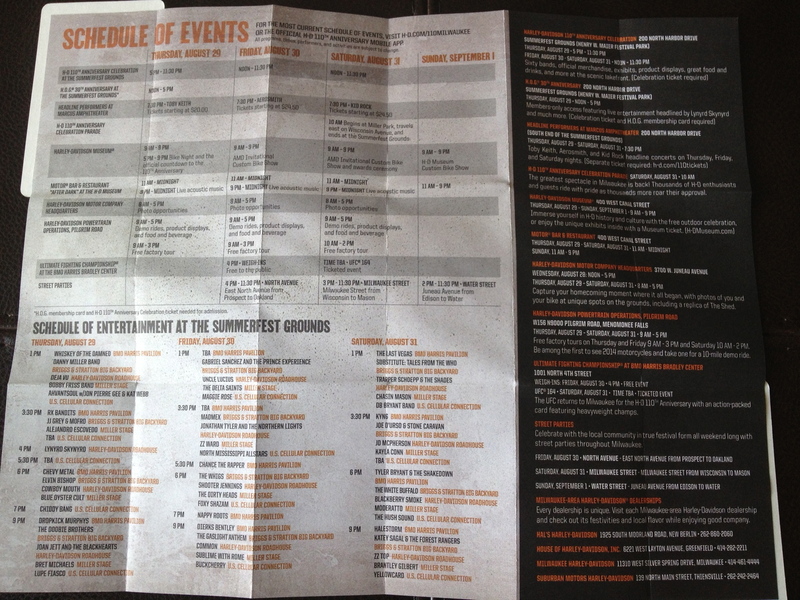 I don’t know about you, but I’ve yet to finalize all my ride plans for this summer. However, I do know where I’ll be riding in August 2013. 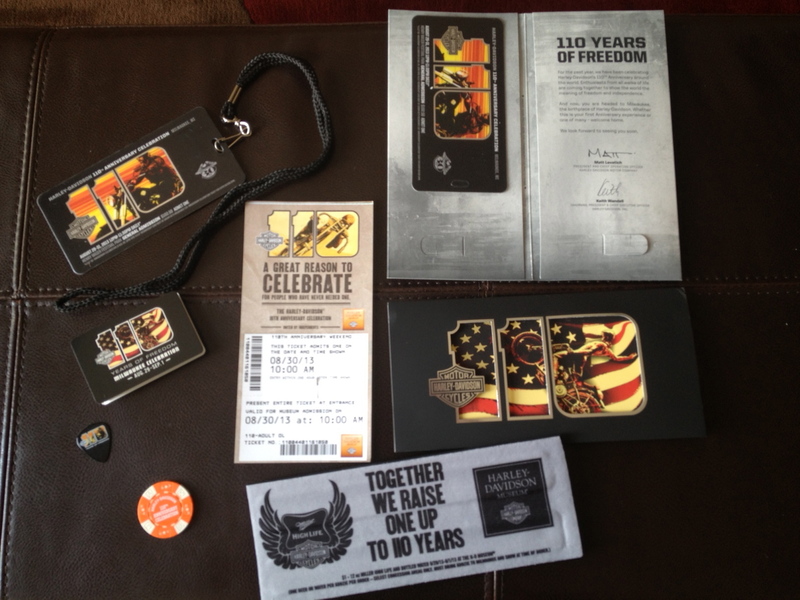 That’s right it’s more than a year away, but I’ve started making plans to attend the 110th Harley-Davidson Anniversary celebration in Milwaukee which kicks off on August 29, 2013! It’s also the H.O.G. 3oth Anniversary celebration. 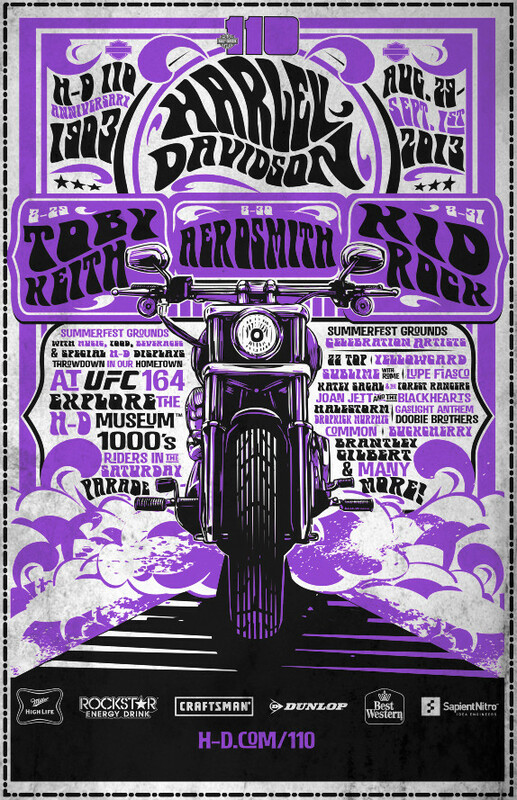 Back in 2008 the event was called the “The Ride Home” for the 105th Anniversary celebration and in my view was an incredible event which was topped off by the Springsteen concert. 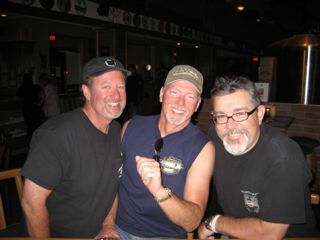 It was a breath of fresh air riding out to this event compared to the typical west coast venues our posse attends. 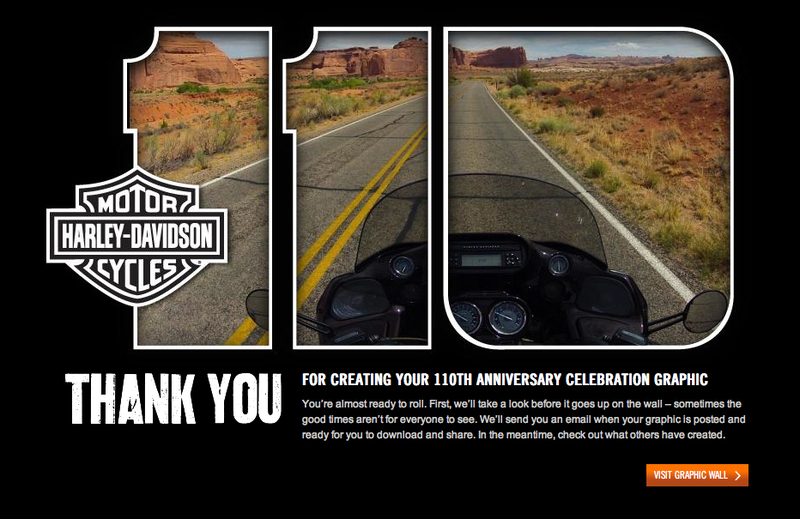 The celebration was awesome and Harley-Davidson scored big in my book. 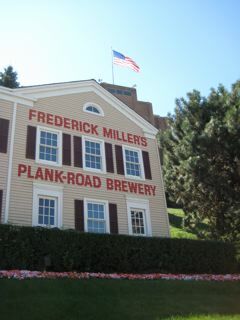 Most important was the terrific city and all the Milwaukeeans who welcomed us riders with open arms. It turns out that H.O.G. members got a jump on the process this past week to make hotel reservations, but it all opens up to the public today so if you’re interested get on the web site and check it out. If you’re looking to get a feel for the ride out to the celebration you can view my 105th Anniversary posts HERE where we started out on the journey. If you’re looking for a view of just the celebration then start at this post HERE where we kicked off the event or if you want more detail about Knucklefest then go HERE or for a wrap up of the event HERE. 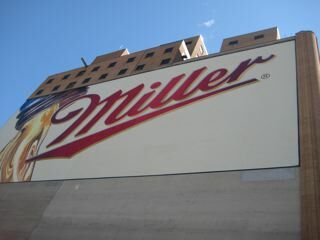 If you’re looking for a recap and a shout out to the Miller girls then go HERE. 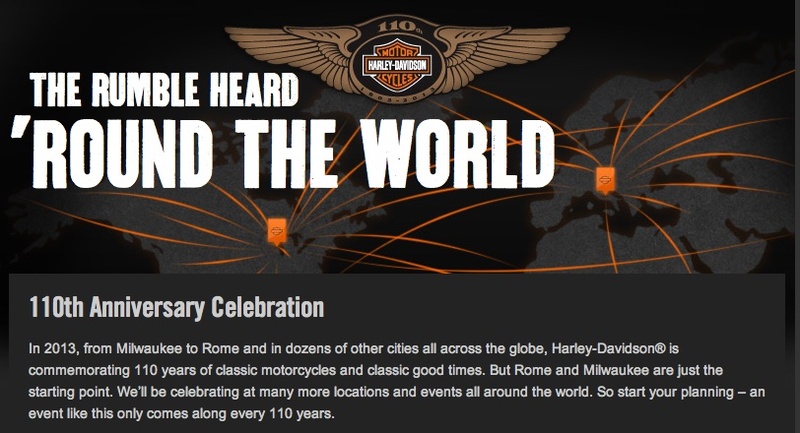 Clearly there is a lot to do at the H-D Anniversary celebration and it’s best to get a jump on planning for it early. Just two months after the “Ride Home” and a couple weeks after Street Vibrations – it was starting to feel like the world was coming to an end. Two major hurricanes (Ike, Gustav) scattered riders and dealer personnel from Texas to Tennessee to Florida…all being affected in some way by the hurricanes. Then as if all those wind “jabs” were not enough along comes this right-handed wallop of a punch with the financial/stock market implosion. People tried to shake off the fear, but it seemed hell-bent to keep stumbling down. To make matters even worse were the stories of people at the end of their ropes and talk of a plan to see martial law declared with certain scenarios or “trigger” points anticipated! Those triggers include a continuing economic collapse, bank closures, social unrest, financial institutions shuttered due to withdrawal of cash or a fraudulent presidential election which entices outrage and violence. So, over the weekend I vowed to eliminate all the talking-heads or any negative hyperbole and nurse my pessimistic ‘tude back from the abyss. I learned a couple of things…first was that the mint leaves (in Mohito’s) are not a vegetable. 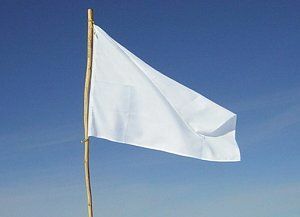 Second I learned more than 20 nifty things you can do with Alka-Seltzer boxes while making a “surrender flag”. And lastly I learned that getting out and enjoying the fall weather, ride the motorcycle or do a little wrenching or [your choice here] is about seizing the opportunity, keep a clear head and to enjoy life. 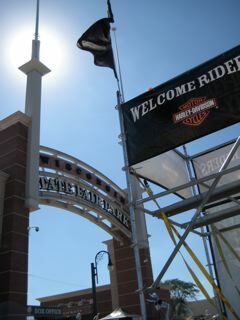 This is our 3rd day in Milwaukee and it has me in a bit of a head spin and this isn’t my first biker event! 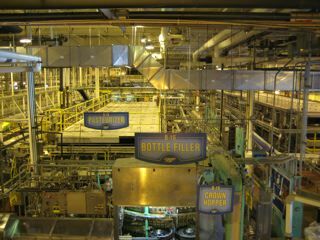 There’s so much to see and do that even the best laid plans get changed or thrown away. To top it off, there are so many people and the venues are so crowded that you’ve got to be willing to take a step back and make alternative plans. Picture (right) is Vietnam Vet Ray Jordan of Salem, OR who decked his 2003 Road King with 105 American Flags for the 105th Anniversary. We gave some thought to either riding in the Harley parade or sitting on the sideline doing a bit of people watching, but after hearing stories that it was going to take about 5 hours to do the 4 mile route we thought better of that idea. With over 40,000 hotel rooms booked and 150,000 people in the area the last thing we wanted to do was “melt” in the 90 degree heat while trying to keep our bikes running so we opted out. I found this cool parade slide show put on by MKEimages. 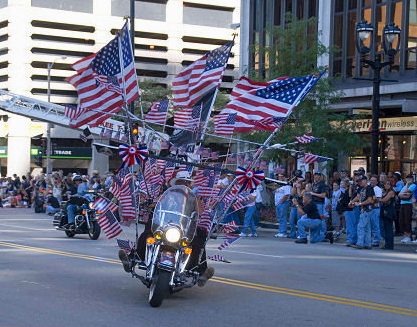 It was estimated that more than 7500 bikes participated in the parade. 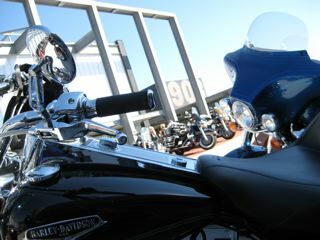 Instead we started the day in line at the State Fair Park waiting to ride the 2009 Harley demo motorcycles. 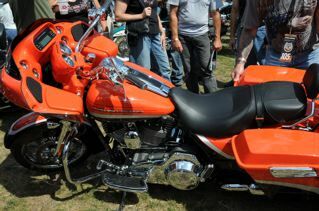 After looking at the SE “pumpkin orange” Glide the previous day I wanted to get some time in the seat to try it out. I’m not a fairing guy, but have always been curious about that fixed fairing on the bike and I really wanted to feel the power of 110 cu in! At any rate, we made our way to the Rider check-in and it was easy enough. The $5 shell card and discount coupon at any Harley dealer was a nice bonus. 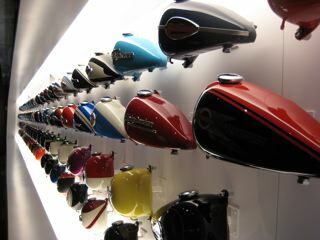 It was rather odd that Harley forced the no helmet, no ride rule in a state that doesn’t require it, but we complied. After check-in we waited in the touring line which took another 45min to finally get onto the bikes. During the entire wait I was thinking this is taking forever for little 10 minute demo ride around the State Fair park, but it turns out the demo rides were 20-25 minutes long and included a combination of city and Interstate driving giving everyone a chance to try out the handling and performance of the motorcycles. Love it or hate it, the frame-mounted fairing is the center of what makes this touring model a pleasure to ride mile after mile. Unlike the popular batwing fairing found on the Street or Electra Glide models, the Road Glide’s fairing is attached to the bike’s frame rather than the front fork, much like the design found on many sport and racing motorcycles. It provides greater stability and less rider fatigue at highway speeds, especially in crosswind situations. The route took me out S 76th Street then right on W. National Ave then after a couple miles I was routed onto I-894. The demo ride team had the route well marked with orange arrows which was excellent since I’m not a Milwaukee native and the roads can be confusing. After a couple of exits the tour route put me back onto city streets where I looped around to the Fair ground. When entering the on ramp I throttled up in 2nd and 3rd gears and the bike quickly hit 80MPH in just a few seconds. Fast! There was little exhaust note from the stock pipes, but I could hear the intake groan for more air. Very fast for a stock bike. I returned approx 25 minutes later to hear the Harley rep ask me if I had a problem with the bike. I said no it’s a terrific bike, why? He then went on a rant… “Dude, you’ve been gone over an hour…did you stop for gas?” I had a stare down with the guy, but I was gone less than 25min and told him he wrote the departure time down incorrectly or something, but he was in error. After a few tense moments he backed down especially after I told him the bike I left with came in at the same time in the standard time frame. 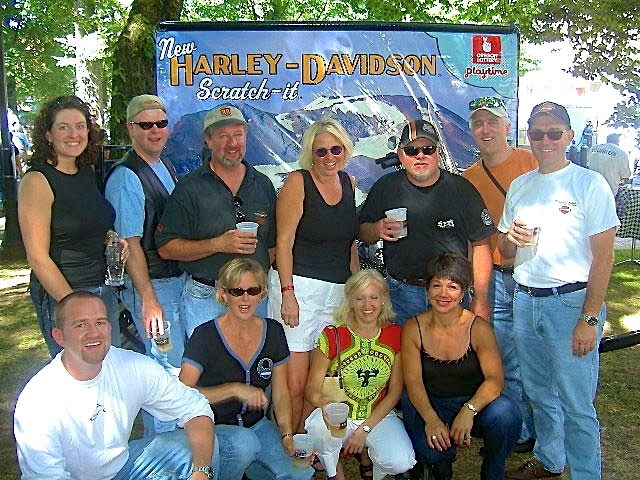 Other than the accusation it was an awesome demo ride and wanted to provide a shout-out to the Harley team for providing the motorcycles to ride. We all departed the demo rides with smiles on our faces and headed off to a local Mexican restaurant for lunch and re-cap our riding experiences. By mid-afternoon we were looking for some relief from the heat and humidity. It was in the mid-90 degrees and we headed to a Harley dealer to pick up some refreshments. 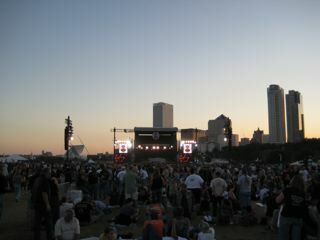 Around 6PM we headed downtown to Veterans Park and the Roadhouse at the Lakefront venue for the Bruce Springsteen concert. The lawn seating opened at 5pm so we thought a couple hours prior to the concert and we’d have a good view. We thought wrong! By the time we hit Lincoln Memorial drive we knew there was going to be issues. Super long lines of bikes park on all sides of the road including many who navigated the middle divide curb to park on the street. After a long while and several heat related stalls on the Road King we finally found a few bike slots to park. We made the long walk back to the entrance and were shocked at the crowds who were all ready posted up waiting. 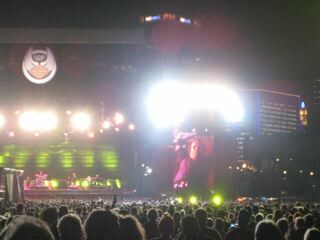 We made our way into the middle and moved forward, but it looked like we were still 2-3 city blocks away from the stage. Springsteen was ending his World Tour, but you would have never known it was the end. He played more than 30 songs which lasted over 3.5 hours. Incredible concert! About mid-way through we move much closer to the stage and got a lot better view of the concert. He didn’t play “Born in the U.S.A.” or his “Devils to Dust” anti-war ballad about Iraq. However, he did make several comments about things that are basically at the heart of being un-American. It was after 12:30AM and we headed out of the city via the East Side which looked like and had a feel of just arriving in a “hood”. Arriving back at the hotel in the early morning it was clear that the 105th Anniversary celebration was an incredible success which was topped off by the Springsteen concert. It was a breath of fresh air riding out to this event. The celebration was awesome and was put on by a great company. 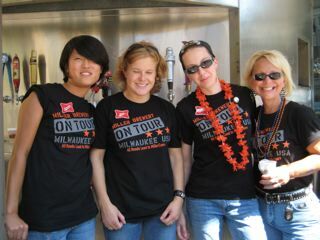 Most important was the great city and all the Milwaukeeans who welcomed us riders with open arms. Flags on motorcycle photo courtesy of MKEimages.com and the 105th Anniversary parade. The motorcycle belongs to Vietnam Vet Ray Jordan of Salem, OR who decked his 2003 Road King with 105 American Flags for the 105th Anniversary.